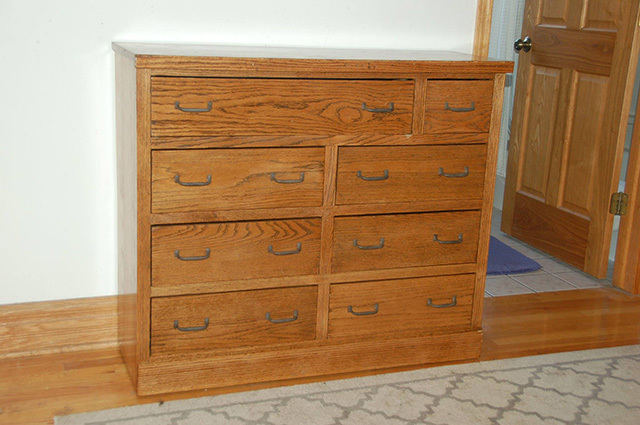 This piece is a set of drawers that was probably built into someone's house years ago. My grandfather used it as his toolbox in his workshop for years. When it came into my posession, it was coverred with multiple layers of oil based house paint. Not knowing what was underneath, I actually had it istting in my garage and I was using it to store tools. One day I was looking for something to do, and noticed that a spot where some carburetor cleeaner had cleaned some of the wood where some paint had chipped off. I could see it was oak, and I pulled out my heat gun and scraped some paint off to see what was underneath. I kept going until I had the whole thing cleaned off. Once the paint removal was done, I had tofix the drawers. The guides were nothing more than 1"X2"s cut down to an L profile. Most were worn down to next to nothing, and some of the drwaers were ready to fall right off the guides. The drawers were in incredibly bad shape as well. 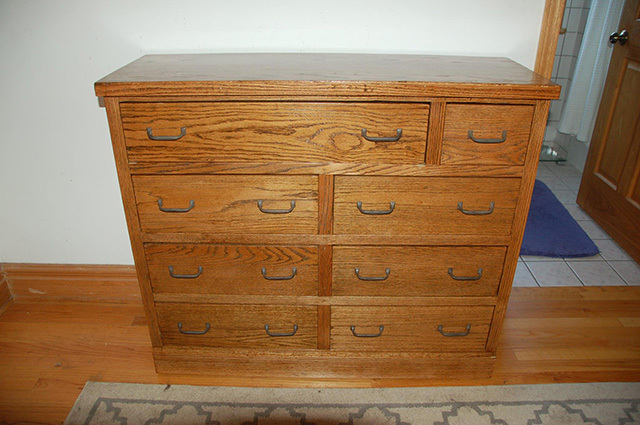 The bottom edges that sat on the drawer guides were worn down, and the drawers were actually taller at the front than the rear. 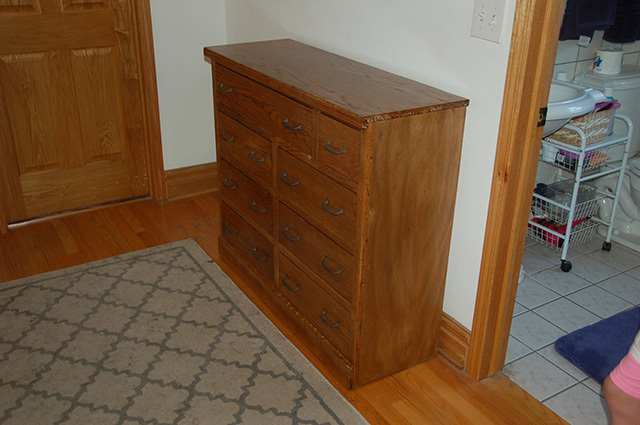 Once the drawer was squared off, I glued a new piece of wood to the drawer side, and then planed it back to its original shape. Once the drawers were fixed, I sanded the whole thing down and put some 1/4" oak veneer plywood on the sides, bondoed up a couple of bad spots, and put a couple of coats of varnish over the whole thing. The drawer pulls were the ones that were on the drawers when I got it. I could tell they weren't original, as they had fake brass plating on them once I stripped the paint off. i threw them in a glass filled with muriatic acid for a few hours (letting it sit outside) and the acid ate the finish off, and gave them a nice patina.